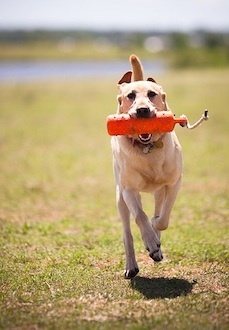 Teach Your Dog to Fetch! What? That's what I said - teach your dog to fetch. Dogs aren't born with the knowledge of how to properly play fetch. It isn't an instinct that most of our modern, domesticated dogs have. True, some breeds such as retrievers will often go and get something that you throw for them, but even they can use a bit of training to clean things up. Some people will be appalled, shocked even that I would suggest such a thing. Who trains a dog to play??? Weeeell, I do! Instinctively, your dog knows on its own how to rough house, play tug-of-war and wrestle. These "games" come naturally to a canine. And while they are perfectly acceptable in the wild (wolves, wild dogs), this kind of rough play should not be allowed in our homes. Why? 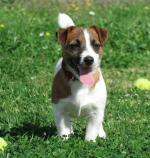 In short, such rough play will lead towards aggression or other bad behavior in your dog. It may not show up immediately, but believe me, it will be evident to some degree in the future. Great exercise for your pooch, all that running around! I've always wanted to live near the beach (and have a dog that loves the water!) to play what looks like the most enjoyable game of fetch ever! 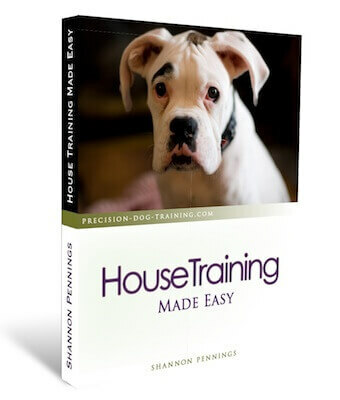 It's helpful if your dog has a solid foundation of at least the most basic dog training. I mean, come on, all dogs should be able to sit and stay on command, shouldn't they? One last caveat - it does make a big difference if your dog actually likes toys, balls, or sticks. My dog, Justice, has no interest in chasing a toy or anything for that matter, let alone picking it up. And while I could teach her a forced retrieve, I believe that fetch still needs to be fun! Certain breeds will catch on much quicker than others. For example, spaniels and Labrador Retrievers were initially bred to retrieve game. So their instincts will kick in and all you need to do is help them perfect what they are already born to do! Your dog picks up the object but won't let go of it - quickly turning things into an annoying game of tug-of-war to get the ball back! Quick note here: don't "trade" your pooch for treat - what will you do when you have no treats in your pockets? Your dog turns it into a game of chase, letting you get tantalizingly close, but then darting away while laughing in your face. Your dog gets the object and takes off, never looking back. It's all about the having in this scenario - he couldn't care less if you chase him or not! Don't worry, the days of Fido getting the last laugh are over. I can show you how to teach him to fetch, reliably. Certain breeds are naturals when you teach your dog to fetch! To avoid that all-too-common hiccup of being left standing forlornly in the middle of the park while your dog takes off with the ball, get yourself a long line. I like to start out with short retrieves, so a 25 or 30 foot long line is enough. Your dog has to be excited about the toy, ball, or stick that you'll be using. Pick his favorite, one that he loves to chase. If you don't have four hands, put the toy in your right pocket, so you're not fumbling around with all your "tools". Clip the long line onto Fido's collar, and tell him to sit on your left hand side. This gets a little tricky at first while you're figuring out all the steps, but stick with it - it won't feel so awkward in a couple days. And always keep a hold on the long line with your left hand while you teach your dog to fetch - if you let go, you have no way of making him bring the toy back to you! Using your right hand and voice, tell your dog to stay. He already knows this command, right? ;) Grab a hold of the line just above his collar to make sure that he stays sitting while you toss the toy. Now... wait... wait... about five seconds or more, and then give your dog a command such as "Fetch!" in a happy, upbeat tone of voice. Why wait? You're adding control to the game, by teaching him to hold your stay command until you tell him otherwise. Keep a hold on the end of the long line, but encourage your pooch to go after the toy. You can verbally praise him while he's chasing it down, too. Once he picks it up, again, verbally praise (Good boy!) but don't repeat the command to Fetch or tell him to come. You've already told him what to do! Now here's the fun part... get ready... if the dog doesn't want to bring it back to you, imagine that you're fishing, and reel him in with that long line. Keep reeling until you have him right in front or beside you, and then tell him to drop the toy (I use the word "Out", but you can use any word you want as long as you keep it consistent). Congratulations! You just mastered how to teach your dog to fetch! Remember to keep it light and fun - after all, it's a game isn't it?